Let me start off by saying I’m sure Pat is an incredibly knowledgeable football coach and a great guy, especially compared to the recent scumbags surfacing all over sports media these days. Nevertheless, I can’t help but compare his demeanor with the Browns offense to that of a controlling, unhealthy relationship. I remember when my friend “Kate” at OSU began a relationship with “Matt”. Our friends didn’t know much about Matt, other than that he was from one of her classes and didn’t seem particularly interesting. What does this have to do with Pat and Colt? Kate was an accomplished high school student, a sweet country girl excited to be at college in the city of Columbus, make new friends, etc. Before Kate dated Matt, she was adjusting to the college life but still making good grades, friends and looked to have a great future. 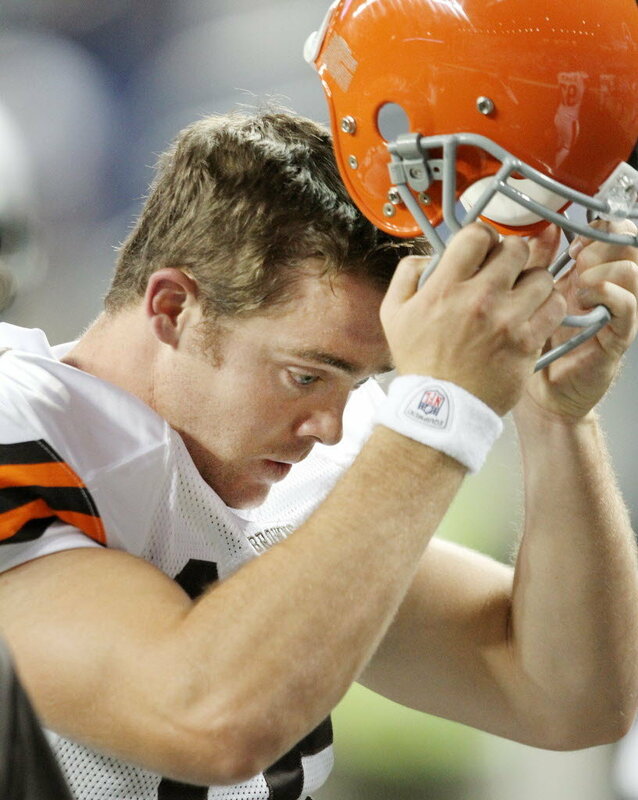 Colt McCoy is your stereotypical all-American Texas boy, and I love him for it. He’s a golden boy that entered the NFL with a myriad of accomplishments and enthusiasm to be a great NFL quarterback. Colt also showed great promise his rookie season, winning games against good teams while still adjusting to the NFL. Over time, it became apparent Matt was controlling Kate. She stopped going to events on campus and never went out with friends. She spent most of her time watching movies with Matt or watching him play World of Warcraft. Kate was losing friends and failing classes, but was intent on being a good, supportive girlfriend. While he didn’t have an aggressive demeanor, he was still controlling Kate in that he wasn’t giving her any opportunities to grow and flourish. He didn’t seem to trust her even though she never gave him a reason not to. Enter Pat Shurmur, with a poker-face worthy of Lady Gaga. This guy is about as emotional as the fern in my office, except the fern occasionally reacts when someone brushes against it. Pat limits Colt to a playbook that appears shallower than my flag football team. He puts him under center even though Colt’s size and style is clearly better suited out of the shotgun. He keeps offensive weapons Colt could utilize off the field. He apparently does not even let Colt audible. Now when you see Colt on the sidelines, he’s by himself. And looking like a sad puppy. I remember one weekend Matt’s ugly ex-girlfriend was in town. All of sudden, he wanted to go out with us that evening; knowing we were going to be at the same bar as his ex. He was trying to look like the cool guy, buying rounds of shots and dancing. Spoiler alert: he ended up sloppy drunk and fell flat on his face. Enter the St. Louis Rams, Coach Shurmur’s former organization. Pat was pulling out a few trick plays, trying to impress his loser ex team. Guess who’s lying flat on their face now? Needless to say, Kate and Matt eventually broke up. Matt dropped out and Kate transferred to a community college back home. I’m sure Matt thought he was a genuinely good guy. I know he wondered why most of us didn’t like him. He thought he knew what was best for their relationship, which ended up leaving both of them damaged and worse off than where they started. Luckily, there may still be time for the Browns. Expand the play-calling beyond Ogbonnaya up the middle. Allow Colt to audible and adjust to the defensive scheme. Give Colt opportunities to grow and flourish…and maybe next time he won’t hand off the ball to our third string tight end.